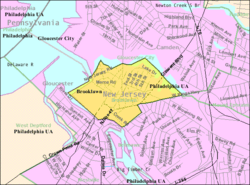 Brooklawn highlighted in Camden County. 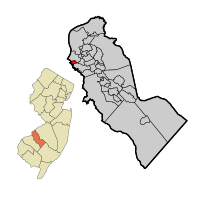 Inset: Location of Camden County highlighted in the State of New Jersey. Brooklawn is a borough in Camden County, New Jersey, United States. As of the 2010 United States Census, the borough's population was 1,955, reflecting a decline of 399 (-16.9%) from the 2,354 counted in the 2000 Census, which had in turn increased by 549 (+30.4%) from the 1,805 counted in the 1990 Census. Brooklawn was incorporated as a borough on March 11, 1924, from portions of the now-defunct Centre Township, based on the results of a referendum held on April 5, 1924. The borough was reincorporated on March 23, 1926. The borough's name is derived from its location and setting. According to the United States Census Bureau, Brooklawn borough had a total area of 0.525 square miles (1.359 km2), including 0.492 square miles (1.274 km2) of land and 0.033 square miles (0.085 km2) of water (6.24%). The borough borders the municipalities of Bellmawr and Gloucester City in Camden County and also borders Gloucester County. As of the census of 2010, there were 1,955 people, 759 households, and 516.1 families residing in the borough. The population density was 3,974.6 per square mile (1,534.6/km2). There were 806 housing units at an average density of 1,638.6 per square mile (632.7/km2)*. The racial makeup of the borough was 87.88% (1,718) White, 5.32% (104) Black or African American, 0.10% (2) Native American, 2.20% (43) Asian, 0.00% (0) Pacific Islander, 2.05% (40) from other races, and 2.46% (48) from two or more races. [[Hispanic (U.S. Census)|Hispanic or Latino of any race were 6.29% (123) of the population. There were 759 households out of which 30.8% had children under the age of 18 living with them, 43.0% were married couples living together, 18.3% had a female householder with no husband present, and 32.0% were non-families. 24.8% of all households were made up of individuals, and 8.2% had someone living alone who was 65 years of age or older. The average household size was 2.58 and the average family size was 3.08. In the borough, the population was spread out with 23.4% under the age of 18, 8.9% from 18 to 24, 29.8% from 25 to 44, 26.7% from 45 to 64, and 11.2% who were 65 years of age or older. The median age was 36.9 years. For every 100 females there were 93.8 males. For every 100 females ages 18 and old there were 89.6 males. The Census Bureau's 2006-2010 American Community Survey showed that (in 2010 inflation-adjusted dollars) median household income was $58,488 (with a margin of error of +/- $4,776) and the median family income was $62,390 (+/- $8,247). Males had a median income of $44,612 (+/- $6,912) versus $32,092 (+/- $20,049) for females. The per capita income for the borough was $26,154 (+/- $2,724). About 0.0% of families and 2.0% of the population were below the poverty line, including 0.0% of those under age 18 and 3.9% of those age 65 or over. As of the 2000 United States Census there were 2,354 people, 961 households, and 600 families residing in the borough. The population density was 5,003.4 people per square mile (1,933.8/km2). There were 1,025 housing units at an average density of 2,178.6 per square mile (842.0/km2). The racial makeup of the borough was 90.27% White, 4.29% African American, 0.08% Native American, 1.06% Asian, 2.38% from other races, and 1.91% from two or more races. Hispanic or Latino of any race were 4.72% of the population. There were 961 households out of which 32.8% had children under the age of 18 living with them, 41.8% were married couples living together, 16.4% had a female householder with no husband present, and 37.5% were non-families. 30.9% of all households were made up of individuals and 12.7% had someone living alone who was 65 years of age or older. The average household size was 2.45 and the average family size was 3.09. In the borough the population was spread out with 25.8% under the age of 18, 8.8% from 18 to 24, 32.3% from 25 to 44, 19.9% from 45 to 64, and 13.2% who were 65 years of age or older. The median age was 35 years. For every 100 females there were 89.1 males. For every 100 females age 18 and over, there were 84.0 males. The median income for a household in the borough was $39,600, and the median income for a family was $47,891. Males had a median income of $36,190 versus $26,591 for females. The per capita income for the borough was $18,295. About 6.1% of families and 7.3% of the population were below the poverty line, including 12.3% of those under age 18 and 4.0% of those age 65 or over. As of May 2010[update], the borough had a total of 8.19 miles (13.18 km) of roadways, of which 5.78 miles (9.30 km) were maintained by the municipality, 1.13 miles (1.82 km) by Camden County and 1.28 miles (2.06 km) by the New Jersey Department of Transportation. NJ Transit bus service is available between the borough and Philadelphia on routes 401 (from Salem), 402 (from Pennsville Township), 408 (from Millville), 410 (from Bridgeton), and 412 (from Sewell). Brooklawn, New Jersey Facts for Kids. Kiddle Encyclopedia.